Hello, fellow humans! 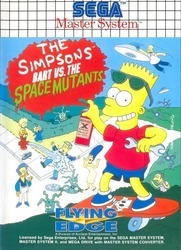 Barthlomew J. Simpson here, with a very important secret: SPACE MUTANTS ARE INVADING SPRINGFIELD! A buncha slimy, putrid monsters are taking over the bodies of the people and they wanna build a weapon that's gonna take over the entire planet! Anyway, yours truly is the only one who can see 'em 'cause of my X-ray glasses - so it's up to me to stop 'em! Save the Earth! BUY THIS GAME! Thanks, man!